The age of no “MB” has gone; the era of who will transfer MB to me has gone… welcome to the era of unlimited internet. In other words, even if you run out of data, you’ll still be connected to the internet. I know some of you are wondering how? 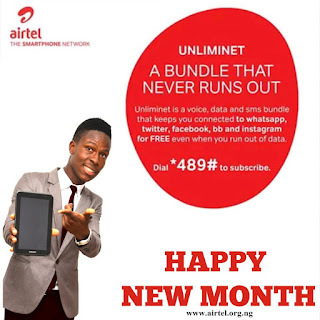 Well, Airtel NG is at it again, unveiling UnlimiNET, the best mobile data plan in town! You’ll get talk time, SMS and data bundles that let you keep browsing even after your bundles run out! That's right, you heard that correctly! All you need to do is subscribe and you'll stay connected to your social networks (Facebook, Twitter, WhatsApp, Instagram and Gmail) when your data is over! The Unliminet Bundles is a deal breaker. It will afford customers the opportunity to take up one plan, usable for Normal Data (including tethering & streaming), WTFB (aka Social Bundle), Voice minutes and SMS. Voice minutes, usable at night between 11 p.m. & 6 a.m.
How Can I Subscribe to The UnlimiNET Plan?